The Unionville-Chadds Ford Board of Education isn’t expected to make a final decision on repealing the requirement of high school music students to participate in marching band until January, after tabling a proposed change to district policy, Monday night. 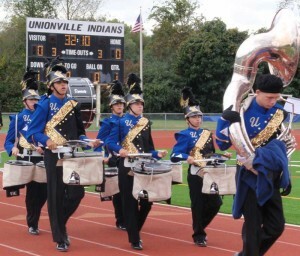 EAST MARLBOROUGH — A move to end the mandate for Unionville High School music students to participate in marching band was put on hold until January by the Unionville-Chadds Ford Board of Education Monday night, after scores of passionate pleas from current and former band members, as well as parents. Although a small handful did speak in support of changing marching band from a co-curricular activity to an extra-curricular activity, the vast majority asked the board to consider other options, such as enforcing the mandate only on freshmen. And while it appeared the change would have passed by a 4-3 margin, the board voted unanimously to table the issue, in part so that further study can be done as well as consideration of other options, such as the freshman-only mandate, as well as giving board members Frank Murphy and Jeff Hellrung, who could not attend Monday night’s meeting, a chance to weigh in. Because of the holiday meeting schedule — the lone December meeting is the typically brief reorganization meeting — the matter will not likely be decided until January, but a failure to decide by then could mean another year of status quo, high school principal Paula Massanari said, as it would begin to impact the class scheduling process for the 2013-14 school year. The board meeting’s normally 15-minute public comment portion of the meeting stretched for more than an hour, as parents and students paraded to the microphone to largely offer support for some sort of student mandate for band participation. Ruthie Kranz-Carl, of Birmingham, the mother of a senior music student, Adam, suggested that the move would be an overreaction to what has largely been a minor issue. But Mark Stookey of Chadds Ford suggested that the demands of marching band keep many students — he cited Boy Scouts specifically — out of the high school’s music program. He identified himself as an assistant scoutmaster and said it is unfair to ask students to give up music studies in order to pursue other outside interests. Meghan Pierson, a senior drum major for the band, noted that she has attained the rank of Gold Award as a Girl Scout — roughly equal to Eagle Scout in Boy Scouts. She said she hasn’t seen band participation as a barrier to being a scout or participating in any number of other activities. “I know numerous Eagle Scouts in the band,” she said. She said in her experience, many Scouts who are also in the marching band are able to work together on scouting projects, and often find themselves with additional connections to the community because of their time in marching band. Numerous students and parents asked the board to consider a compromise position: only requiring freshmen to participate. When the board took up the subject later in the meeting, it appeared four members: Eileen Bushelow, Jeff Leiser, Keith Knauss and Holly Manzone supported removing the requirement, while Kathleen Do, Victor Dupuis and Gregg Lindner seemed to be willing to at least entertain a compromise. Dupuis said he was concerned that the board as a whole had not had much time— only last week’s board workshop — to discuss the issue, although it had been discussed at length at the board Curriculum subcommittee. Another concern, he said, was that virtually all schools in the area continue to have a requirement — and he said it is his understanding that the one area school that doesn’t require it, is now considering making marching band a requirement. Although Leiser, a former officer in the band’s booster organization, said he felt the requirement should be lifted. But since there appeared to be no harm to delaying the decision, he said it made sense to get more input and allow the missing board members to have their say. I strongly agree with Mr. Stookey’s perfect logic. As a tax paying parent, he has every right to expect a well-rounded education that includes a music program. Parents should have the choice not to participate in marching band activities. Parents and are the arbiter, not the band director, as to how our children should spend their time when not in school. I disagree with Mr. Stookey. I was SM of a Kennett Troop for some years, and my sons all participated in Unionvilles marching band, and the troop. First, kids need to know how to make decisions, compromise and talk to the faculty (and scout leaders) to reach workable solutions. I know Scott Litenberg is a former eagle Scout,and also is a Vigil Honor recipient in the OA…Scott’s father was involved with Scouting for many years,and even on a more national level. Scott obviously takes the marching band seriously, but he also was willing to find solutions with any of my scouts. I found the Kennett music department was much more rigid in their views towards compromises with scouts.